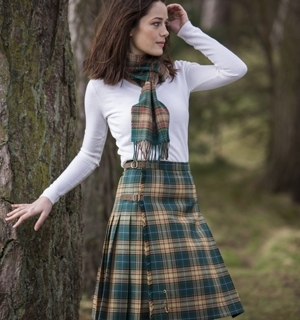 Kinloch Anderson provide a superb range of tartan and tweed skirts, including traditional, contemporary and silk, all made with great attention to detail to create the perfect garment. Our skirts are made specially to order in your measurements. All our skirts are made by our very own experienced seamstresses and if you so wish you can watch our skirts and kilts being made right here on the premises through our Heritage Room viewing window. There are no less than 6 generations of Kinloch Anderson craftsmanship behind these skirts and we take extreme pride in every one that is produced. Every skirt can be made in a tartan or tweed of your choice using our fabric tartan and tweed finder.